We are staying at the TLT in Tororo, which is not nearly as nice as the five-star hotel in Kampala. I think two stars might be generous for the TLT, but it meets all the basic needs. 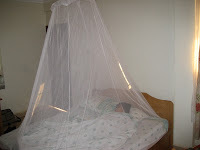 A place to sleep, equipped with a mosquito bednet. When we asked about the name, we were told it stood for "Tender Loving Touch." We later learned that it is also "Town Lodge Tororo," which makes more sense. At dinner, the cook came out to help us navigate the menu. He could only recommend one Indian dish, so we ordered chicken masala for four, which was quite good. To accompany my meal, I ordered a fruit juice. Our dinner companion advised me to say with a straight face, "Bring me passion." It came out straight away.